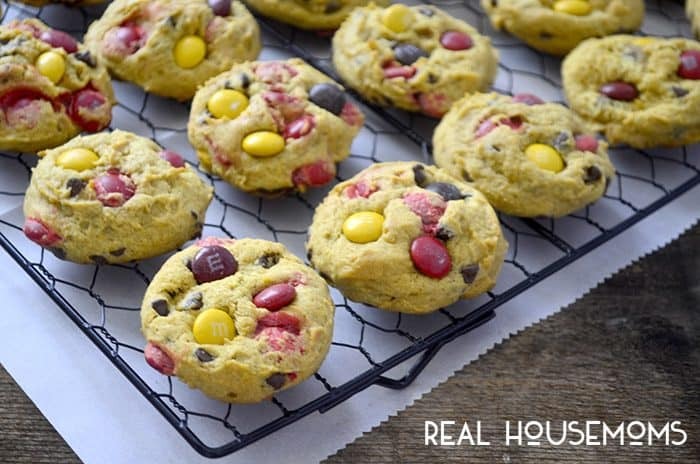 PUMPKIN M&M CHOCOLATE CHIP COOKIES are the perfect fall bite! Pumpkin spice and chocolate meld together into cookie bliss! Are you ready for fall? The leaves are changing. Temperatures are dropping. Halloween decorations are in stores and the “pumpkin spice” frenzy is in full swing! To get a head start on the fall baking I started with pumpkin cookies! 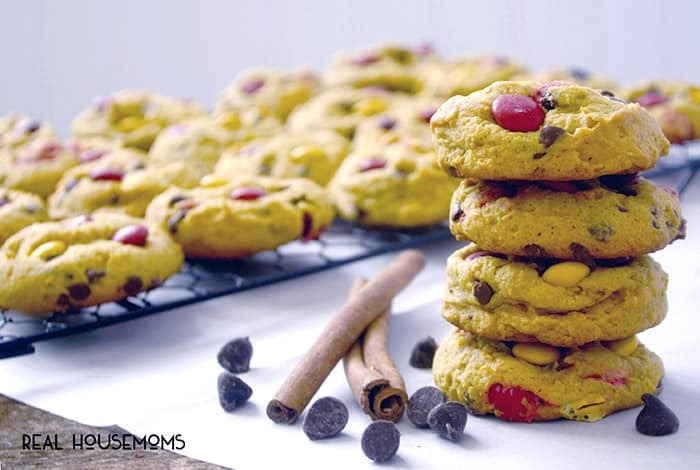 Pumpkin and chocolate are a great combination and everyone loves a Pumpkin Chocolate Chip cookie recipe! 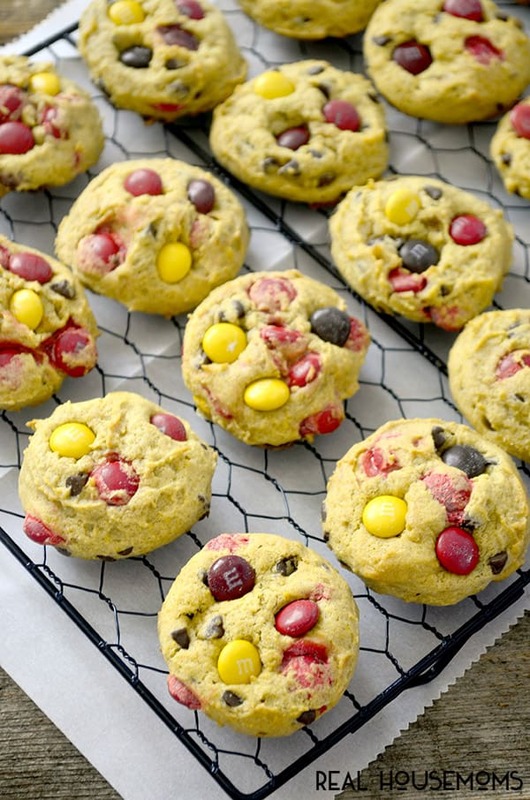 While I was out shopping I came across Fall M&M candies and I knew I had to put them in my cookies WITH chocolate chips! That’s right candy coated chocolate pieces and chocolate chips in my cookies, yes please. 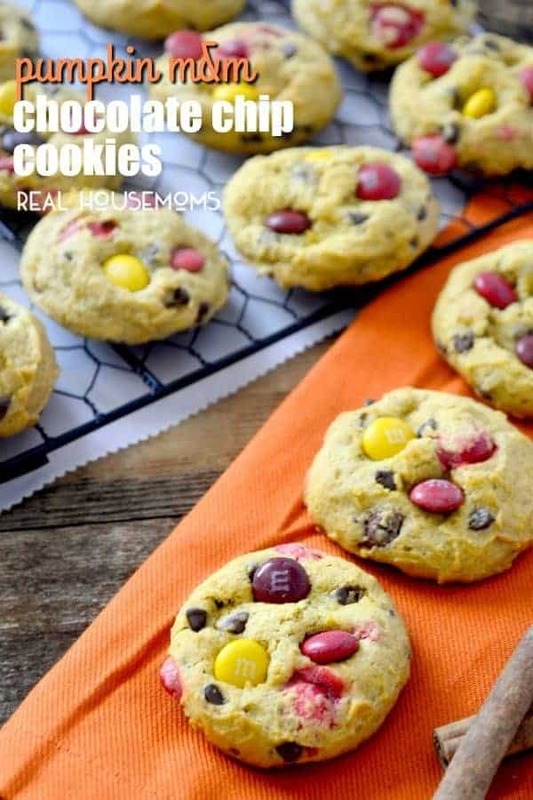 These Pumpkin M&M Chocolate Chip cookies are one you will want to make ASAP! I love that these cookies stay so soft and moist thanks to the addition pumpkin. These cookies aren’t overly sweet wither. You would think with the addition of M&M’s and chocolate chips they might get too sweet but they didn’t. They are the perfect combination of pumpkin spice and chocolate! I was surprised when I tasted one of these little gems the next day. They were even better than having them warm from the oven, the flavors melding together into the best fall cookie! Heat the oven to 350 degrees F. Spray cookie sheets with nonstick spray or line with parchment paper. Using a mixer, beat the butter and shortening until smooth. Beat in the white and brown sugars, mix until light and fluffy. Beat in the egg, vanilla and pumpkin puree. In a large bowl, whisk together the flour, baking soda, baking powder, salt, and pumpkin pie spice. Slowly beat the flour mixture into the batter in thirds. Stir in the chocolate chips and the m&m's. Scoop the cookie dough by heaping tablespoons onto the prepared cookie sheets and bake for 13 minutes, or until the cookies are browned around the edges. Remove the cookie sheets from the oven and let them rest for 2 minutes. Take the cookies off with a spatula and cool them on wire racks. If you’re a cookie lover these cookies will hit the spot for sure. They are easy to throw together and everyone will love them!